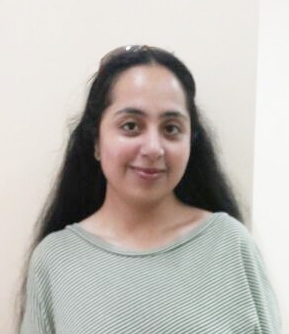 In the recently tabled Budget 2015-16, the Indian Government has allocated Rs. 2,46,727 crores for the defence spending, marking a modest increase of 10.95 percent over the last year's budget of 2014-15 which was pegged at Rs 2,22,370 crores (revised estimates) with the focus on 'Make in India' for quick manufacturing of defence equipments. The moderate escalation in defence spending comes at a time when the Defence Ministry has some big ticket procurements in the pipeline with some already being in their final stages and expected to get materialized in this fiscal and thus seems inadequate. The increase in the defence budget has the following impact on almost all key components (see Table). This is the broad defence allocation given by the Finance Ministry, however, the detailed allocation of each sub head will be given by the Defence Ministry in about two weeks time. 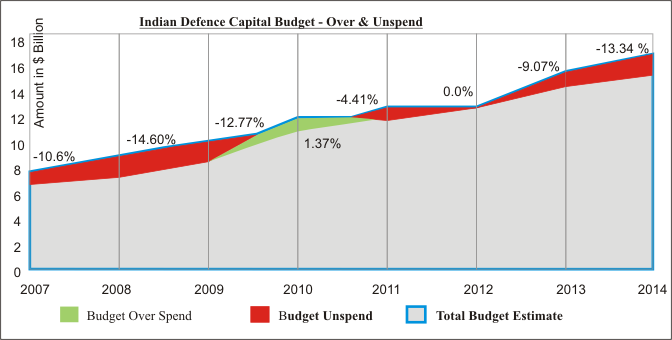 The capital and revenue expenditure are the two main components of the defence budget. Out of the total budget Rs 152139 crores has been allocated for revenue expenditure and Rs 94588 crores has been earmarked for capital expenditure. 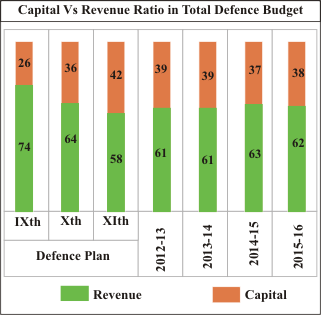 The share of percentage of capital allocation in defence budget as compared to revenue allocation has seen a decrease this time, witnessing a decline of 1.99 percent from the previous year comprising 38 percent of the total budget this time. On the other hand, the revenue expenditure has witnessed an increase of 8.35 percent and comprises 62 percent of the entire budget for the fiscal 2015-16. A look at the previous years with regard to rational between revenue and capital expenditure depicts that the capital expenditure has been witnessing less than 40 percent of allocation almost every year which is definitely not healthy considering that this sub head caters to the fresh procurements and also payments from previous liabilities. Refer Fig. The Capital budget is divided into two notional categories: capital acquisition and other-than-capital acquisition. While the capital acquisition budget is spent on acquiring new weapon systems and platforms required for modernization of the armed forces, the other than capital acquisition segment of the capital budget caters for expenditure on acquisition of land, development of civil infrastructure and the entire capital expenditure of the defence research and development organization (DRDO) and the ordnance factories. In the budget for 2015-16, the capital outlay has been scaled up to Rs 94588 crores up from the revised capital expenditure of Rs 81965 crores allocated in 2014-15 witnessing a hike of 15 percent from last year which does not seem substantial considering the number of billion dollar deals in the pipeline to be signed. Rs 12623 crores from the Defence Budget 2014-15 was transferred from the capital expenditure account to the revenue expenditure account in the revised estimates for 2014-15 that is why the hike seems substantial in general but which is not the case in actuality. Amongst the three services, the Air Force has been allocated the lion's share of the capital budget about Rs 31481 crores, compared to the Navy's which stands at Rs 23910 crore and followed by the Army's who has been allocated Rs 21574 crores. 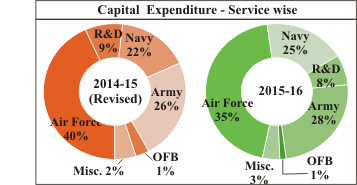 The below given pie chart depicts the share of the defence services in the capital budget. 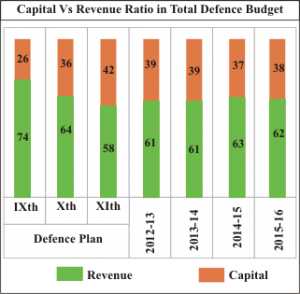 The capital allocation of this year does not seem to be in sync with the respective modernization plans of the three defence services. The money allocated for capital expenditure will not only go towards the procurement of new weapons and systems, but a lion's share will go towards meeting committed liabilities in the form of payments for contracts signed in previous years (which accounts for about 75-80 percent of the total budget), not leaving much for new projects. At present, India is at the last stages of negotiations on a series of huge procurement contracts, especially the IAF long pending list of procurements that includes 126 French Rafale fighter jets, 22 Apache attack choppers and 15 heavy-lift choppers, six mid-air refueling aircraft which are likely to get affected the most given the IAF's allocation remaining stagnant this year indicating that the government has not allocated substantial amount. Similarly the Navy is looking to expand its capabilities and build more submarines including a few nuclear powered ones, indigenous aircraft carriers and other warships. The Army too is on a modernization drive and looking for better assault rifles, artillery guns, night vision equipment etc. considering this the recent market capital allocation in the defence budget does not seem to do justice with this regard. 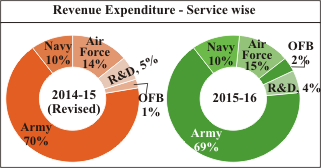 Below given Table depicts the segment-wise allocation of the three defence services. The revenue expenditure, which caters to the 'operating' expenditure of the three services, is pegged at 152139 crores; a Rs 11734 crores rise from previous revised allocation of Rs 140405 crores. As always the salary and wages for the defence force personnel accounts for about half of this budget. While the remaining is spent on stores and equipment, revenue works maintenance and transportations among others. In 2015-16, the revenue expenditure has increased by 8.36 percent with its ratio in the total budget being increased from last 61 percent to 62 percent this year. The defence budget has made a provision of Rs 144.21 crores, the biggest till date, for prototype development under the 'Make' procedure witnessing an upward swing from previous year's revised allocation of Rs 0.50 crores. Hopefully this increased allocation would give a boost to the much talked about 'Make' projects Tactical Communication System (TCS), Battlefield Management Systems (BMS) which had been under the discussion for long time. However, if India intends to develop indigenous industry and wants to follow the 'Make in India' path for manufacturing of defence equipments then it needs to allocate more funds under this sub head especially on the wake of the fact that the defence manufacturing, particularly by the emerging private sector, needs substantial investment on plant and machinery, technology and skill development. 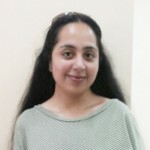 The real tragedy is that MoD has been surrendering about 10 percent of the allotment almost every year as a result the Ministry of Finance has not been allocating the projected amount. The low hike in defence spending comes at a time when the Defence Ministry has some big ticket procurements in the pipeline with some already being in their final stages and are expected to get materialized in this fiscal. The revised estimates of Rs 222370 crores for the year 2014-15 indicate that this fiscal also the defence budget remained under spent by Rs 12623 crores. The spending shortfall came entirely in the crucial capital procurement head, where the defence ministry was able to spent only Rs 81965 crores, of the capital allocation of 2014-15 which stood at Rs 94588 crores witnessing a shortfall of Rs 12623 crores. Besides the Rs 6630 crore that will be returned unspent from the capital head, the Defence Ministry transferred another Rs 6000 crore from the capital to the revenue head. The increase of Rs 24357 crores in the overall defence allocation seems to be inadequate and not in tune with the military modernization as the amount sanctioned generally gets partially neutralized by the high annual inflation rate that still hovers between 6 and 7 per cent, the steep fall in the value of the rupee against the US dollar coupled with the traditional rise in the global prices of arms (5-10 per cent annual inflation in defence equipment costs) and thus will be insufficient to give a major boost to the military modernization that has been languishing for over a decade. Rather if we consider the inflation rate then it would be astonishing to note that the actual rise in defence budget this year would be just mere 5 percent. Below given graphs depicts the growth in defence budgets year on year when we take into consideration the average rate of inflation every year. Also to be seen that this year's defence budget marks the lowest in over three decades in terms of ratio to the GDP but also the lowest in terms of percentage of the total annual government expenditure. At 1.75 per cent of the estimated Gross Domestic Product (GDP) for the coming year, this continues a steady decline over the last two years. This is remarkably low for India in at least three decades, with the figure dropping considerably from 3.16 per cent of the GDP in 1987 as well as lower from previous year's 1.78 percent. The defence budget accounts for nearly 13.88 percent of the total central government expenditure for the year 2015-16 which is Rs 1,777,477 crores, a nominal increase of 1.18 percent from last year's 12.70 percent but still significant compared to previous years. 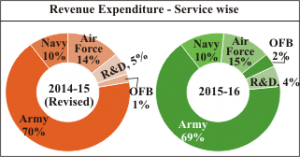 The Armed Forces have always been demanding a defence outlay of 3 percent of the GDP, which is essential to keep its defence force battle worthy and fit for war but the projected GDP of this year falls really short. In the year 2014-15, there were committed liabilities of nearly Rs 70,000 crores, which left only Rs 5,400 crores for new acquisitions. As for the 2015-16, considering the cut in the capital budget this year and the moderate increase, it is understood that not much amount will be left for new procurements. Rather the present allocation is not even sufficient enough for the already contracted defence deals. Taking into account the amount allocated this year for capital budget which stands around Rs 94588 crores and deducting an amount (around 20 percent) of Rs 18917 crores (to be utilized on other-than-capital acquisition) and another amount (around 80 percent) of Rs 60536 crores (to be utilized for 'committed liabilities'), it can be seen that only Rs 15135 crores will be left for new acquisitions this year which is definitely not much especially taking into account the MMRCA deal worth Rs 66000 crores which calls for payment of 15 percent at the signing of the deal itself. This means India will have to pay around Rs 9900 crores itself at the time of inking the deal. Apart from this deal, nearly over Rs 50000 crores worth defence deals are in pipeline and on the inking stage which includes: 6 Airbus A330 tankers, 22 Boeing Apache attack helicopters & 15 Chinook heavy lift helicopters, light howitzer guns from BAE Systems, 98 Black Shark torpedoes from WASS, 1,418 Israeli-made thermal imaging sights for T-72 tanks, 262 Barak missiles from Israel Aerospace Industries. The need of the hour is long-term planning for modernization and to supplement it with committed funding. In mid eighties the defence plan with matching resource allocation were formulated, resultantly achievement of planned targets was to the desired level. Since then the five-year plans had no assured funding but allocations based on annual budgets, due to long lead times in projects from concept to delivery and most failed to fructify in time. With three-fourth of the total allotted budget being spent on maintaining the three Armed Forces and furthermore not much increase in the capital budget clearly implicate that only a few new weapons will be ordered this year. The capital acquisition is likely to suffer the most which has already been under acute pressure in recent years due to the overwhelming share of the 'committed liabilities' arising out of contracts already signed. The surrendering of unspent budget and transferring a part of it to Revenue expenditure as a practice in the past highlights need to reduce the revenue expenditure. There is also need to streamline teeth to tail ratio with the defence services to control the revenue expenditure. The defence services need to focus on only the core activities and the support activities like maintenance and logistics services be privatized as is the global practice nowadays. Very concise statement of facts and lucid analysis. It made a rewarding reading on the eve of the Union Budget 2016-17. Let’s see how many lacunae get redressed. I want to ask from where u got capital acquisition data… I was try to get the data from Union Budget report but was not to get can u pls give me the source from were u got the data. Very informative.Any such plans to write the same for budget 2016-17. If already it is in place, link please.